It's announcement-of-an-announcement season! 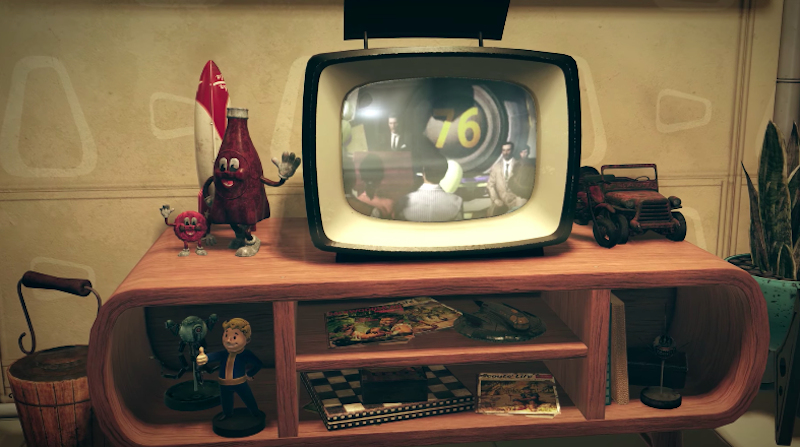 Bethesda, the company behind several huge franchises, is teasing a new Fallout game, and as fans eagerly wait to see what it might be, they have spent hours watching a Twitch stream that shows nothing but a television and a Vault-Tec bobblehead. Update: We know now what the reveal was: Fallout 76. When Bethesda announced Fallout 76 with a teaser trailer this morning, promising more information at E3, it was easy to assume that the new game would be a traditional single-player role-playing game. But Fallout 76 is in fact an online survival RPG that's heavily inspired by games such as DayZ and Rust, according to three people familiar with the project. Well, occasionally other things are happening. But it's safe to say that fans aren't tuning in to see people wander in and out of frame - they want to know what the next Fallout game will be. Based on Bethesda's history of these teases, there's a strong chance that it will be announced tomorrow morning, 24 hours after the teaser first went live. The last game in Bethesda's massive post-apocalyptic RPG series, Fallout 4, was announced in June 2015 and launched in November of that same year. One might expect a similarly short announcement-to-release timeframe this time around. Some fans have also theorised that this might be some sort of remaster of Fallout 3 or Switch port of Fallout 4, but from what we've heard, this is a new game, one that takes the series in a brand new direction. We're expecting to see more tomorrow. Bethesda's E3 press conference, where the publisher will show this game and more, will take place on Monday, June 11 at 11:30AM AEST. Not really. It's a clever play on the on going test pattern theme that has been there since the first Fallout game. Bethesda have used this sort of teaser before. It would be annoying if they had it up for 6 months, but usually they just play it for a day or so, and it's exciting. No-one is forcing anyone to watch it. Personally I'll let Kotaku watch it for me and then tell me the news once it is announced. Annoying if they had it up for 6 months... again. I still remember the wait for Fallout 3. That's what I'm hoping for here. Fallout 5 in November (with a brand new engine) - more info at E3 - and here's Fallout Shelter 2 to keep you going til then. As an optimist I am often disappointed, but that's OK, because I live in a world of cotton candy and coloured lights. And Fallout 76 isn't a total disappointment. It isn't what I asked for, but Santa is a busy man. I'd have snorted with laughter if it wasn't so bloody plausible. As it is, I am regarding your comment with a stony expression of disapproval. Wasn't there also rumors of Fallout Shelter 2? That would send people over the edge. I'd actually love if it was FOS2, but then they did a Steve Jobs-style "...and one more thing" and announced FO5. Wait there is going to be a new Fallout game?!! This better not just be Fallout 3/New Vegas remastered or something. If it's this Starfield set in the Fallout universe then goodbye Fallout lore, You're now fully retconed into space, As a Fallout fan who's played every Fallout, Why am i not excited? Why am i dreading this? Is it Fallout online? A Fallout 3 remaster or something that changes my favorite ip further into something i don't recognize? I should be happy but i'm just feeling anxiety honestly. Fallout 3 remaster on the switch? Would not be shocked. Yeah, FO3: SE. Remastered with texture improvements and unofficial patches! I guarantee you this is not a new mainstream Fallout game. They will be working on a new Elder Scrolls first. My money is on F4 or F3 on Switch. Could be a new F Shelter though, or another spin off. New Fallout by Obsidian would be pretty cool? They should make a Fallout game but change the setting to a fantasy world and call it Elder Scrolls VI. I'd buy that. I'm really hoping that TES6 is being built in mind with the option of a war between the Empire and The Dominion, with the ability to shape the course of that war in meaningful ways beyond scripted 'kill respawning waves' skirmishes over a handful of remote forts (Skyrim's 'civil war' was pretty much mostly off-screen), and that the reason this hasn't been announced yet is because they still don't have the technology to do justice to that kind of full-blown war. DEATH TO THOSE SNOOTY, POINTY-EARED BASTARDS. SKYRIM BELONGS TO THE NORDS. I think that's the kind of thing where the idea is probably better than the reality. I just can't really imagine how large scale battles with dozens of enemies / allies would work in an Elder Scrolls game. "Commander. What word from the battlefield?" "The scouts have just returned, my lord! When scripted conversation ended and combat flags activated, the melee charged as planned, and the magic casters on each side blew up their own respective skirmish units almost immediately." "The elves had the greatest magic capacity so suffered the greater losses. From there, our archer divisions scattered and ran for the hills or tripped up the remaining meleers. The ones who didn't clip through the world or get stuck on terrain started firing into the magic shields and the backs of the few remaining friendly melee units. The Hero of the Empire ran into the fray and slew an impressive number of the enemy, but their friendly fire caused our armies to turn on them, at which point every last soldier on the field was slain, stripped naked, and dumped in a corpse pile. The scouts reported the Hero of the Empire made several trips by horse to loot the dead." "The enemy fielded greater forces in this battle, thus suffered the greatest losses, and the Hero of the Empire is still technically in our faction, so this is technically a victory." I really enjoyed killing Stormcloaks. I hope it's a new main series entry but I'm also prepared for it to be a Switch port/remaster of something or maybe, as someone else mentioned, Shelter 2 (or something along those lines). Fallout 4 was three years ago? Jesus. Where did my life go? Ladies and gentlemen, we have a winner. Fallout New Vegas Special GOTY Remastered VR Edition. First DLC will access to Creation Club for $30. Is this going to be 'Starfield'? A vault that went into space? ...and I thought television was stupid.